For decades divers have searched for the USS Perry DMS-17, a destroyer sunk by a mine in the Palauan Islands two days before the famous World War II assault on Peleliu. But it took a sailor who felt the heat of that explosion 56 years ago, who was lifted into the air by its impact, then swam for his life, to find it. The destroyer was sweeping for Japanese mines on Sept. 13, 1944, to prepare for the Marine landings on the tiny islands of Peleliu and nearby Angaur. 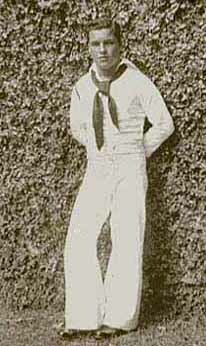 Larry Trunks in his Navy uniform around 1941 in San Diego. Larry Tunks was firing anti-aircraft guns aboard the Perry when it scraped a mine off Angaur, exploding a boiler and killing eight crewmen. One of those killed was his closest ship buddy, a fellow Nebraskan. Another 146 men were plucked from the ocean by U.S. warships in the area. 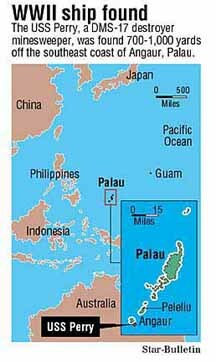 A sailor looks deep into Palau's waters -- and his past -- to find the ship that nearly took his life. When divers Navot Bornovski and Jeff Wonnenberg surfaced after confirming they had found the USS Perry, an excited Larry Tunks jumped into the sea. 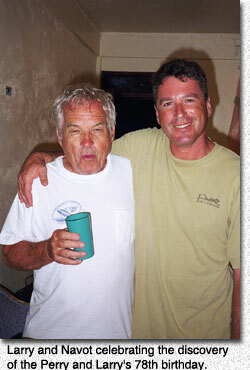 Tunks, now 78, hired a search crew in Palau several weeks ago. They followed Navy coordinates logged at the time of the explosion, but he felt the Perry had been closer to shore. Following his instincts, within an hour the crew detected something lying 240 feet deep and 700-1,000 yards off Angaur's southeast coast. While Tunks stayed on the surface, a dive team went down to get the first glimpse of the destroyer since 1944. On July 14 Bornovski will lead a dive expedition that will include network TV and magazine crews. "Everybody's talking about it," Bornovski said. "People have been looking for it for so many years." It was a determined veteran who finally succeeded. Tunks hasn't dwelt on the war over the past 56 years. But newsman Tom Brokaw's book describing the Americans who won World War II as "The Greatest Generation" inspired him to search for the Perry. "Everybody's been looking for her, but I was the first survivor from the ship to ever go back and look," the Huntington Beach, Calif., resident said in a phone interview. "It was a pretty emotional minute. There's a lot of hurt there." Navot Bornovski - Jeff Wonnenberg - Larry Tunks. 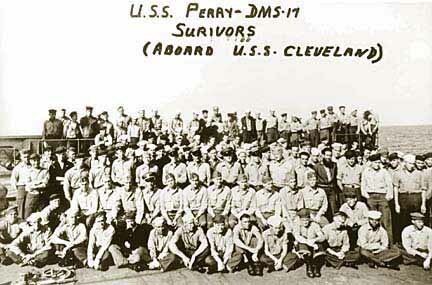 Survivors of the sunken USS Perry, after their rescue by the USS Cleveland. 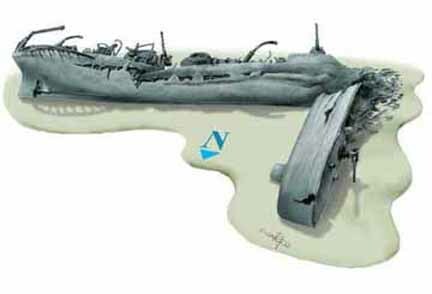 On Sept. 13, 1944, fate put Tunks on the port gun, the side that didn't get hit by the mine. But his buddy wasn't so fortunate. He had placed his wet clothes in the engine room to dry quickly and had just opened the hatch to get them when the mine hit at 2:18 p.m., flooding the hatch with steam. "We were so close to shore the (Japanese) soldiers on the beach were firing their guns and rifles," said Tunks, who swam out to sea without a life jacket or other support. Eventually he was picked up in a life raft. The Perry, which had survived the Pearl Harbor attack, went down at 4:07 p.m. Tunks' friend and another sailor died on a rescue ship, and he watched them buried at sea. The remains of the other six could be entombed in the ship's No. 1 fireroom, near a boiler that exploded. An action report submitted by Navy officials on Sept. 23, 1944, said a search before the ship was abandoned found "no trace" of the men. Tunks remains emotional over the deaths. Still, the Perry's discovery has excited him and other World War II shipmates, as well as divers and historians around the world. Dan E. Bailey, author of "World War II Wrecks of Palau" and books on Truk and Kwajalein lagoons, searched for the Perry years earlier. 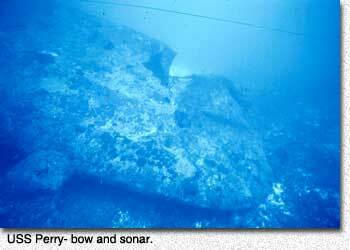 Bailey said there are few U.S. warships sunk in battle that are accessible to scuba divers. Besides the Perry, the cruiser USS Houston lies in Indonesian waters near Java. Others are too deep or rest in unknown locations, Bailey said. The USS Arizona in Pearl Harbor can only be viewed from the surface. But at 240 feet, a first-hand look at the Perry will be limited to experienced "technical" divers using special equipment. Navot Bornovski, owner of Fish'n Fins dive operation in Koror, Palau, led the expedition with Tunks. On May 1, discovery day, Bornovski and one of his instructors descended, staying only seconds to confirm the discovery. The next day they dived the Perry for six minutes. Although they didn't get photos or video, other divers have done so since then. "It's in perfect condition because it's so deep," said Bornovski. "The guns and ammunition boxes are just like they were laid down a few days ago." Bornovski said the single mine the Perry hit did not cause much damage, but the destroyer broke in half. It lies on its side, still connected at about a 20-degree angle. Because the destroyer lies outside the lagoon, he estimated the visibility at 400-500 feet, compared to 40-50 feet in Truk Lagoon, grave site of many Japanese warships. And the Perry's depth has prevented much coral growth. The discovery of a U.S. warship in Palau that was sunk by a mine during World War II could pose a dilemma for the Navy. The USS Perry lies at 240 feet, making it accessible to scuba divers in a country where the biggest industries are tourism and diving. The remains of six sailors could be entombed in a fireroom. Military officials in Hawaii say the Navy has just been alerted to the May 1 discovery of the Perry and can't comment on any decisions regarding the destroyer minesweeper. Navy policy states that the Navy retains control over all naval vessels and aircraft, even those lost in foreign countries and waters. The Navy also considers sunken ships as fitting burial sites and memorials for lost Americans, said Johnie Webb, deputy commander of the Central Identification Laboratory Hawaii, which recovers and identifies U.S. military remains. 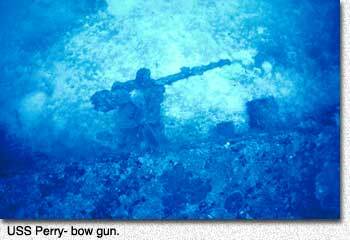 The Navy has never recovered remains off sunken ships, Webb said. But some say that should change. According to World War II historians, there is only one other U.S. warship sunk during battle, located off the Indonesian island of Java, that is accessible to scuba divers. Japanese remains are still entombed in a few sunken Japanese warships in Truk Lagoon, and divers enter those wrecks, according to wreck historian Bill Remick, who has researched the Perry. "People have no compunction about diving on these things," Remick said. "It would seem to me to be incumbent upon the Navy to reclaim the remains. That settles the problem." Francis Pogue, 75, of Virginia Beach, Va., was on the Perry when it was hit. Pogue said he believes divers should be allowed on the wreck, but "it should be treated the same as a cemetery, with the same respect. He also believes nothing should be removed unless families request remains or the Perry survivors vote that certain property be recovered. Our experience would be that if remains have not been exposed to tidal activity where they were washed away," Webb said, "they are probably still there." He said that if families requested remains, the decision would be up to the Navy. The eight who gave their lives Eight men died when a mine sunk the USS Perry in Palau on Sept. 13, 1944. Their names and home states, according to the U.S. Navy, are: Joseph Brand, New York; Paul Burnette, Tennessee; Frank Byrd, Ohio; Henry Edgell, West Virginia; Ottice Joplin, Texas; Arthur Schieber, Minnesota; Donald Schomer, Nebraska; Dan Wersebe, Texas. Burnette and Schomer died on a rescue ship and were buried at sea. The others are believed to have died inside a fireroom. They were not found before the ship sank. 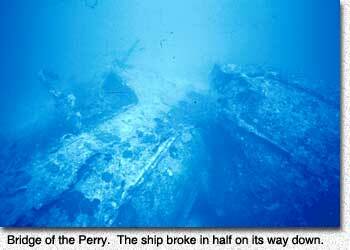 shipwreck hunters looked before, the USS PERRY was found in 240 feet of water lying on her side. It was Larry Tunks 78th birthday that day! Due to the explosion in the engine room, the ship broke in half when she sunk, yet the two parts are still connected. The stern lay west to east and the bow south to north. On their first dive, Navot Bornovski and Jeff Wonnenberg identified the wreck. On May 2, 2000, the stern area including the 4' stern gun along with the port side of the engine room was inspected. The visibility around the island of Angaur is phenomenal (more than 300 feet, the Fish n Fins boat could be seen on the surface! ).